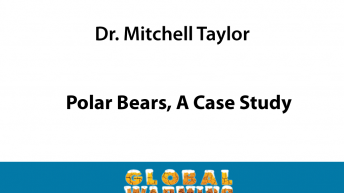 Mitchell Taylor, PhD, is a Canadian biologist specializing in polar bears. Taylor was involved in research and management of polar bears for the Northwest Territories and Nunavut Territory since 1987. Dr. Taylor was a member of the Canada’s Federal Provincial Polar Bear Technical Committee until 2008. Dr. Taylor has published over 50 scientific papers on polar bear related topics, has worked in the field on most of the world's polar bear populations. Most recently he and colleagues completed the Davis Strait population inventory (one of the most southern of all polar bear populations) and is a co-author on Canada’s Committee on the Status of Endangered Wildlife in Canada (COSEWIC) polar bear draft status report. From 2004 to 2008, he was also manager of the decentralized and relocated Wildlife Research Section.